Few politicians have attracted quite so much controversy in recent times as freshman Minnesota Congresswoman Ilhan Omar, a Somali immigrant whose Muslim faith has made her a target for many on the right and even some on the left, her comments about money in politics and America's problematic relationship with the Israeli government making her a target for conservatives and liberals alike. But who is she, really? Norah Shapiro's documentary, Time for Ilhan was made before Omar was elected to the United States Congress in 2018, but offers a portrait of a woman fighting for justice against a system seemingly stacked against her. 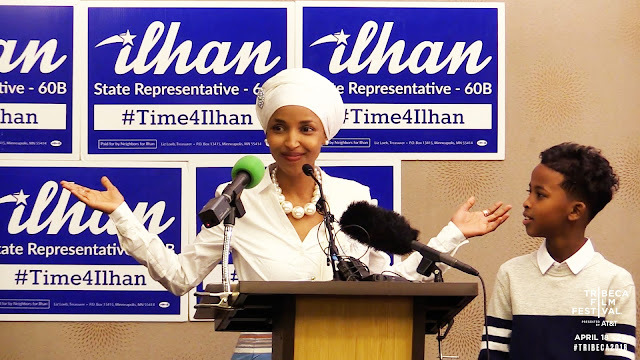 Centering around her 2016 run for the Minnesota State House, Time for Ilhan offers a rare behind-the-scenes glimpse at the inner workings of Omar's journey toward becoming the first legislator of Somali descent in American history. While her district had a very large population of Somali refugees (a point Donald Trump used as a weapon in his 2016 campaign for President), Omar still faced a fierce primary campaign against 44-year incumbent, Phyllis Kahn, as well as pushback from a party that was unsure of what to do with her. It's a bit of foreshadowing to the Democratic pushback against Omar's criticisms of Israel just this year. But through grassroots organizing and a focus on ideas rather than experience and longevity, Omar eventually broke through for a resounding victory. Director Norah Shapiro also spends some time with Kahn, who begins the film with a somewhat arrogant sense of entitlement, pooh-poohing Omar's chances and endorsements, before becoming a more contrite and humble figure after Omar's victory. While Time for Ilhan never really goes beyond surface-level inquiries into the candidate's ideas and motivations, it does take the time to investigate some of the conspiracy theories and fake scandals that continue to plague her. As the first Muslim elected to the United States Congress (along with Michigan Representative Rashida Tlaib), much of the resistance to Omar has been deeply rooted in Islamophobia (see recent remarks by Fox News host Jeanine Pirro about Omar's hijab being unconstitutional). These are clearly very personal and hurtful criticisms for Omar, and she shuts down production of the documentary for several weeks when a particularly nasty rumor about committing immigration fraud by marrying her brother takes route in right-wing circles (an accusation that still floats around in conservative fake news memes to this day). And yet despite the pushback, Omar always comes back stronger than ever, even more determined to fight for the things she believes in. Time for Ilhan is not a great documentary, but there's something deeply inspiring about Omar that Shapiro manages to capture. It's a feel-good hagiography to be sure, but it also offers a more personal look at who Omar really is, free of the noise of cable news punditry and partisan fear-mongering. She has seen the effects of injustice firsthand, and seeks to fight it wherever it takes root, a fight that has lead her to the halls of the United States Congress as part of a new generation of progressive lawmakers looking to shape a more just and equitable nation for all. Personally, I can't wait to see where it takes her next. 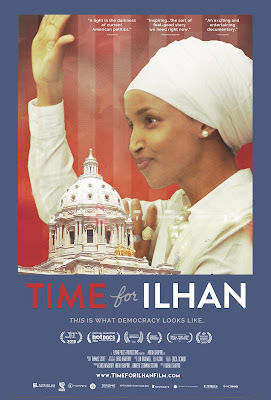 TIME FOR ILHAN | Directed by Norah Shapiro | Not Rated | Now available on DVD and VOD.